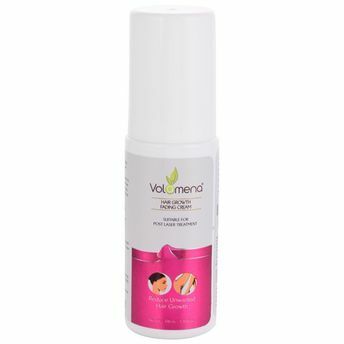 Volamena Hair Growth Fading Cream is a natural solution to unwanted facial and body hair. Get soft and smooth hair free skin easier with this hair growth inhibitor. It has Emollient Plant Enzymes of Larrea Divaricata (creosote bush) and purified Papain fruit to reduce hair growth significantly after application of 4 weeks. It is a versatile, lightweight cream formulated in a way that minimizes and slows the unwanted hair growth, while whitening and preventing bumps, ingrown hair, folliculitis and breakouts that occur after conventional hair removal methods. Helps reduce & retard hair growth in all areas - face, chest/breast, arms, legs, stomach, bottom, and bikini-line. The natural ingredients synergistically heal the skin quicker after hair removal, whilst the allantoin keeps the skin smooth, soothed and nourished. The desired results are guaranteed; however, the period will vary for each person. You should start to see results within days, and the hair growth slowdown will come in a matter of a few short weeks.